Learn how to easily open multiple images at once into Photoshop, and automatically place each image on its own separate layer within the same document, using Photoshop's Load Files into Stack command. The traditional approach is to open each image or file into Photoshop one at a time and then copy and paste, or drag, each one into your main document. But unless you're getting paid by the hour, there's a better, faster way to work. In fact, all we really need to do is tell Photoshop which images or files we need to open. Then, just sit back and relax while Photoshop creates a new document, opens all of your images into that document and places each one on its own separate layer. Let's see how it works! This tutorial is Part 6 of our Photoshop Layers Learning Guide. Going to File > Scripts > Load Files into Stack. 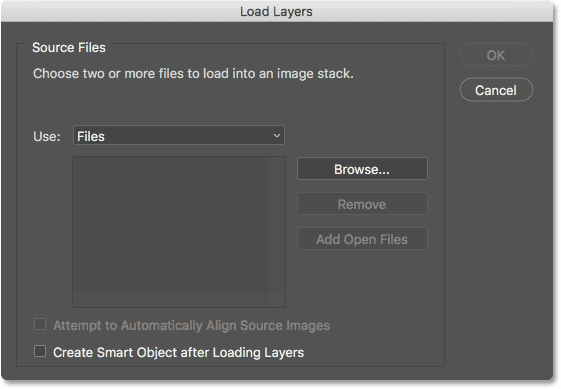 The Load Layers dialog box. All we need to do here is tell Photoshop which images or files we need to open, and there's two ways to do it. 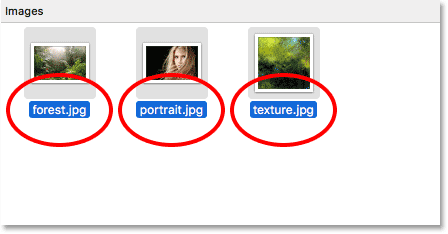 One is to simply choose a folder on your computer and then let Photoshop automatically select every image or file it finds in that folder. 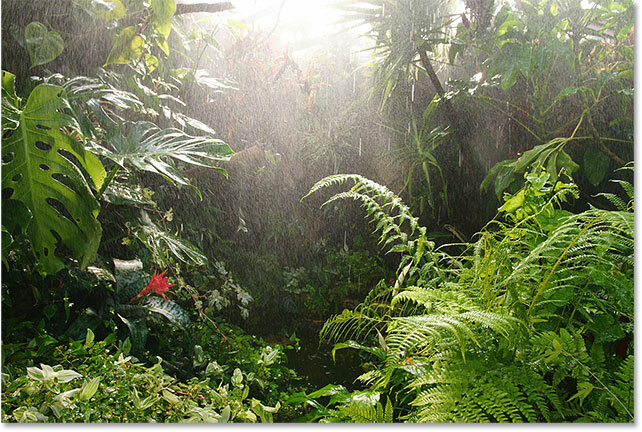 The other is to navigate to a folder but then manually select images or files within the folder yourself. Setting "Use" to "Folder", then clicking "Browse". This opens a File Explorer window on a PC or a Finder window on a Mac (which is what I'm using here). Navigate to the folder's location on your computer. In my case, my images are all in a folder named "photos" on my Desktop. 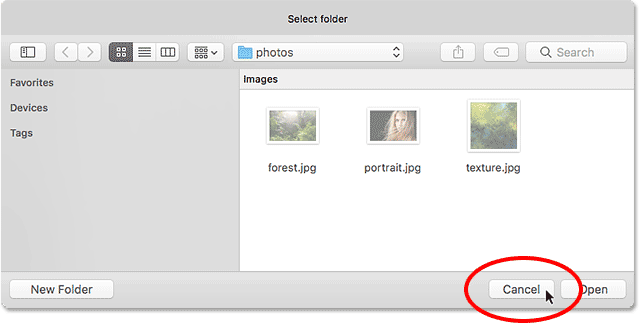 Click OK (Win) / Open (Mac) to automatically select all files within the folder. Clicking "Cancel" to close out of the window. Changing "Use" to "Files", then clicking "Browse". Just as before, this opens a File Explorer window on a PC or a Finder window on a Mac. Navigate to the folder that holds your images. I'll navigate to the same "photos" folder on my Desktop. Notice that this time, the files are not grayed out, which means that we can select just the ones we need. 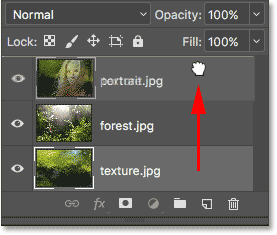 To select files manually, click on one image to select it. Then, press and hold the Ctrl (Win) / Command (Mac) key on your keyboard and click on the other images you want to open. Manually selecting the images I need to open. The file names will be used as the layer names. The dialog box shows the names of the files you'll be opening. To remove a file, select it, then click "Remove". 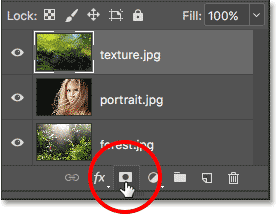 Clicking OK to open the images in Photoshop. 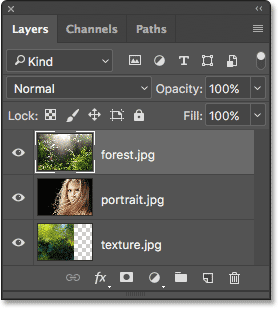 The Layers panel showing all three images on separate layers. The image on the top layer. Photo credit: Adobe Stock. 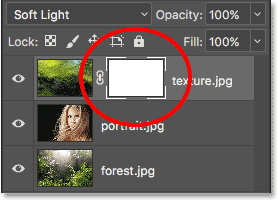 Clicking the visibility icon for the top layer to turn it off. The image on the middle layer. Photo credit: Adobe Stock. 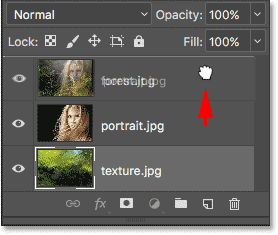 Turning off the "portrait.jpg" layer. 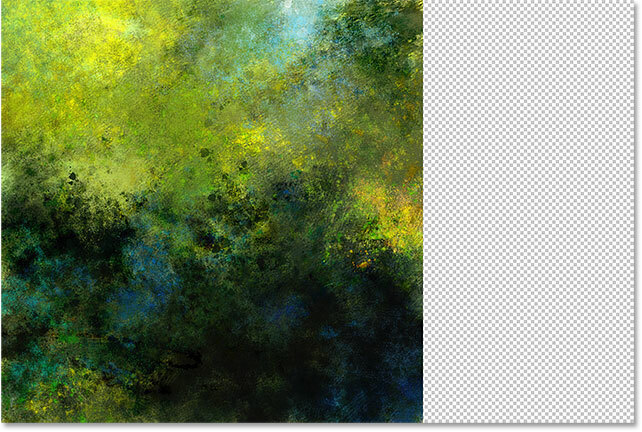 And here's what the image on the "texture.jpg" layer looks like. Notice the checkerboard pattern to the right of the image. The checkerboard pattern is how Photoshop represents transparency on a layer. When Photoshop created the new document to hold the images, it set the Width and Height values of the document based on the width and height of the largest images. The image on the bottom layer. Photo credit: Adobe Stock. At this point, we've learned how to load our images into Photoshop as layers. 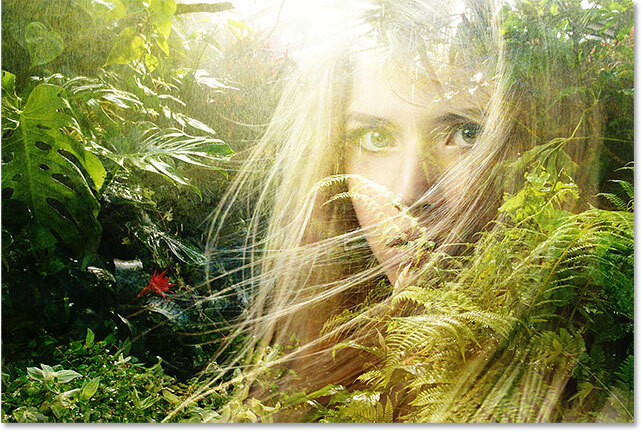 But to finish things off, I'm going to blend my three images together. Since blending images falls outside the scope of this tutorial, I'll go through the steps fairly quickly. 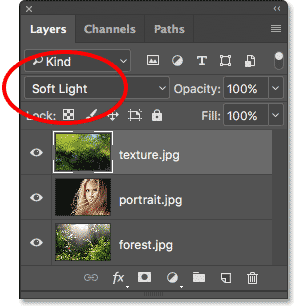 Selecting the "texture.jpg" layer in the Layers panel. This places the Free Transform handles around the image. I'll click on the handle on the right of the image and drag it further to the right until the image fills the entire layer. Normally we'd want to avoid resizing an image in such a drastic way because we'll lose image quality, and also because we're distorting the photo's original aspect ratio. But in this case, since I'm using it only as a texture, I can get away with it. 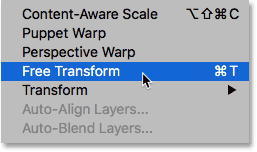 Resizing the texture image with Free Transform. Turning the top two layers back on in the document. 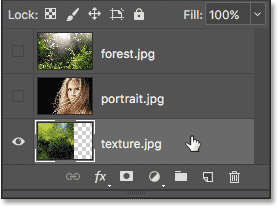 Dragging the "portrait.jpg" layer above the "forest.jpg" layer. 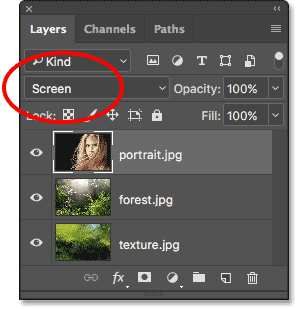 Changing the layer blend mode to Screen. The result after changing the portrait layer's blend mode to Screen. 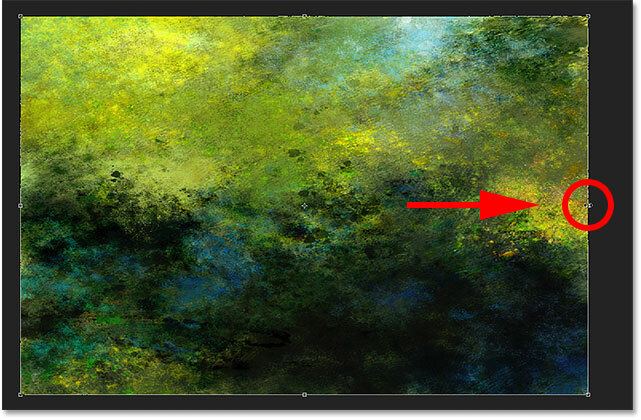 Dragging the "texture.jpg" layer to the top of the layer stack. Changing the blend mode of the texture layer to Soft Light. The result after changing the texture's blend mode to Soft Light. The only thing I don't like at this point is that, after blending in the texture, there's a couple of areas in the bottom half of the image that are now looking too dark. I'll fix that by hiding the texture layer in those areas using a layer mask. Again, I'll go through this quickly, but I'll include a link at the end where you can learn all about layer masks in Photoshop. 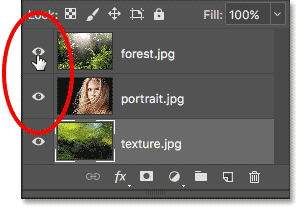 Clicking the "Add Layer Mask" icon. A layer mask thumbnail appears. Setting the Foreground color to black. Hiding the texture layer from the shadow area to the left of the woman's hair. Hiding the texture layer in the lower right. 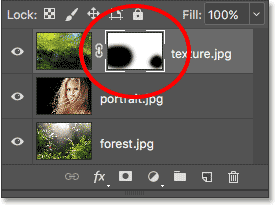 The layer mask thumbnail shows which areas of the layer are now hidden. And there we have it! 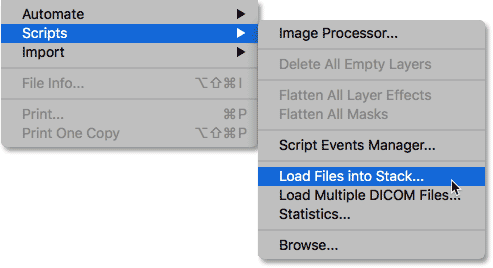 In this tutorial, we learned how to easily open multiple images as layers in Photoshop using the Load Files into Stack command, but it's not the only way to do it. 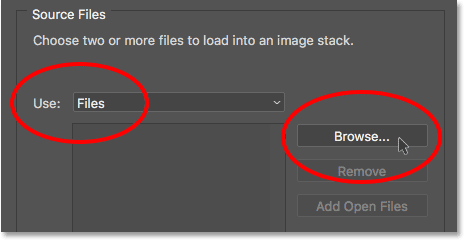 If you prefer to select and open your images from within Adobe Bridge, check out our related tutorial where you'll learn how to load images as layers directly from Bridge using the Load Files into Photoshop Layers command! In the next tutorial in our Layers Learning Guide, we'll learn all about Layer Groups and how they make it easy to keep our layers organized and our Layers panel looking neat and tidy! Or, check out our Photoshop Basics section for more tutorials!